Japan possesses the most severe guidelines for anti-seismic buildings in the world; surely this is one of the reasons that many constructions not affected by the Tsunami resisted to the earthquake. Also a map after the Mercalli earthquake scale (displaying the possible destructive effects of an earthquake) shows that on the mainland the reached intensity was "fortunately" lower than feared, because the epicentre laid far off the shores. Fig.1. 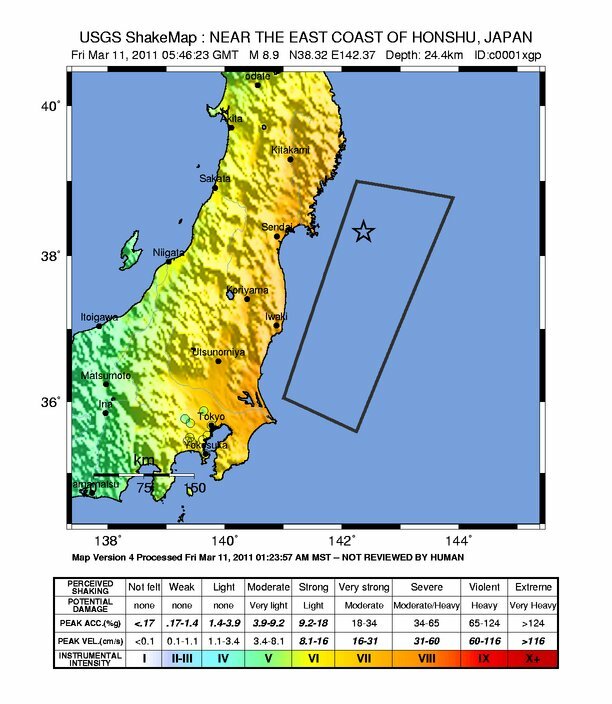 Mercalli intensity scale of the 8.9-9.1 magnitude earthquake of 11.03.2011 in Japan, after U.S.G.S. 2011. Unfortunately preventing procedures or constructions for a Tsunami are virtually impossible, it were mainly these waves that caused much destruction and possibly killed thousand of people on the western coast of the island of Honshu (The German Aerospace Center (DLR) released satellite images and maps of the affected area on the shores of Japan). It seems also that it was the Tsunami that damaged severely the emergency system and cooling devices of the nuclear plant of Fukushima-Daiichi, a possible break of the containment of the nuclear material is now the greatest concern - Evelyn Mervine at Georneys posted an important interview about the anti-seismic guidelines, the damage and the actual situation at the power plant. A sort of anti-seismic buildings were already known in ancient Japan, many Buddhist pagodas show some features that can minimize the dangerous oscillations of a building caused by an earthquake. Some of these constructions tricks are possibly based on the observation of the biological characters of bamboo - the largest members of this grass family can reach a height of 30m. In a pagoda the central column made of a single log is reaching deep in the ground like a root, it can swing in all directions and will so absorb most of the kinetic energy during an earthquake. The various floors of the pagoda can move independently and are connected to the inner central column by a complicated construction made of wood, acting like a spring or shock absorber it will also minimize dangerous movements. The first modern principles of anti-seismic building were introduced at the beginning of the 20th century in Tokyo. 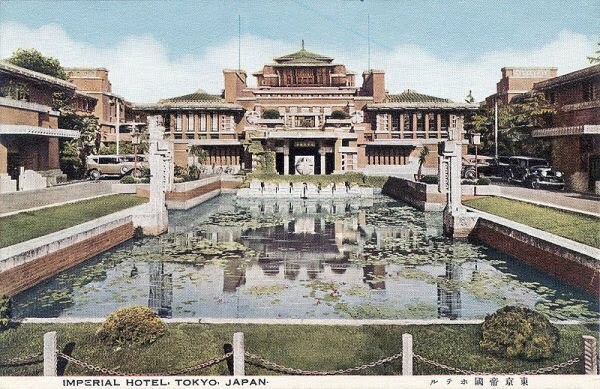 The "Imperial Hotel" was commissioned in 1915 and inaugurated in 1923 as a luxury hotel for foreigners in imperial Japan. It was projected by the American architect Frank Lloyd Wright (1867-1959), who visited Japan for a first time in 1905 and became enthusiast of Japanese Art. Fig.2. 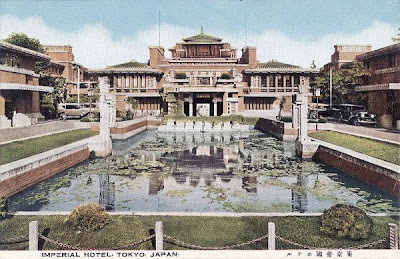 The "Imperial Hotel" in Tokyo (1930s-40s), image from Wikipedia. The site for the hotel seemed unfavourable for such a building, located in the seismic zone of Tokyo on a 2,4m thick organic soil resting on 20m of alluvial and unconsolidated sediments. On such a ground engineers normally choose to build a deep basement, trying to reach competent rock mass or as deep as possible to anchor the building in the underground. Wright in contrast projected a very shallow basement, just reaching 2-3m deep. He argued that deep fundaments during an earthquake would transfer the oscillations from the ground to the building; however the alluvial mud of the construction site should absorb the seismic energy and the hotel float on the sediment like "a battleship floats on water." - The pool in front of the entrance was not only a decorative element, but provided a source of water for fire-fighting. This feature saved the hotel from the firestorm raging after the 1923 earthquake. - Cantilevered floors extending to the outside of the building and balconies provided extra support for the floors. - The walls were not constructed simply with bricks, but with a sort of innovative sandwich technology: reinforced concrete between an extern and intern layer of bricks. - Tapered walls, thicker on lower floors, increasing their strength, with small openings and fewer windows than the upper floors. - A light copper roof would not oscillate as strong as a massive roof and stress the construction, with the danger of collapse of the entire building. - Seismic separation joints made of lead, located about every 20 m along the building; during an earthquake the single segments and floors should be able to shake independently without breaking. - Separated hollows with suspended piping and wiring, instead of being encased in concrete, as well as smooth curves, making them more resistant to fracture. Wright recognized the danger of lacking water or electricity after an earthquake by the rupture of conduits or wires, also the danger of gas or fuel outpouring and alimenting fire. - Dispensation of unnecessary decorative features on the outside of the hotel, which during an earthquake tend to break and can kill people. The hotel was inaugurated the 1. September 1923, at 11.58 local time Tokyo was hit by a massive earthquake with a magnitude of 8.3 after Richter, 5.000 buildings collapsed in the entire city, thousands were heavily damaged. "Hotel stands undamaged as monument to your genius - Congratulations"
Wright's passing the telegram to journalists has helped perpetuate a legend that the hotel was unaffected by the earthquake, even the only building still standing in Tokyo. In reality, the building was damaged; the central section slumped, several floors bulged and four pieces of stonework fell to the ground. The building's main flaw was its shallow foundation, during the earthquake the basement sunk by 0,6m into the liquefied mud and in the subsequent years continued slowly to sink into the underground. The damage and instability of the entire construction (also the passing time) finally resulted in the necessity to demolish the entire hotel in 1968. However many of the other anti-seismic features introduced by Wright are still in use, and hopefully many new technologies will minimize the deadly effects of future earthquakes.